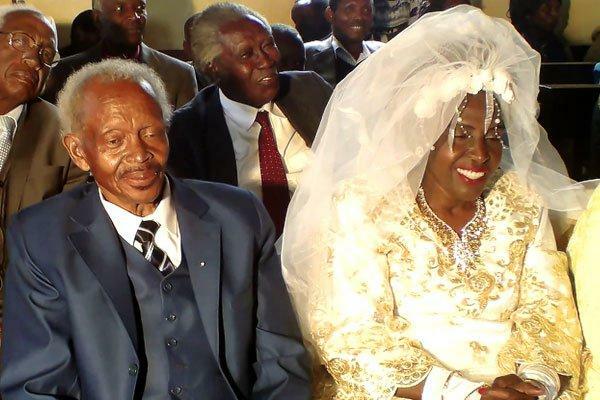 A 60-year-old woman, Teresiah Njoki, on Sunday got married for the first time, to 78-year-old Ayub Mugo Waitara, a widower. Waitara, a grandfather, said he had been lonely for the past 10 years. “I knew she would fall in love with me because I kept on praying for her,” Mr Waitara said. Mr Waitara said he called all his five children and informed them about his new love and they promised to support his pursuit of Njoki. On her part, the bride Njoki said that at first, she resisted Mr Waitara’s marriage proposal, but she could hear a voice compelling her to accept the proposal. “I feel so happy; I had kept telling God to reveal to me the man he created for me. Despite old age, I have met him, I love him so much,” she said after exchanging marriage vows. The couple, however, said they had no intentions of having any children. The groom’s firstborn, Mr Chege Waitara 50, said their father’s happiness was their priority. “We are happy to have a mother and we shall live happily as one big family,” he said.